At the end of a long day, I love to sit quietly, sip a glass of wine, and contemplate life. Tonight, I’m relaxing in the Winter Dreaming Tree, the January group gift from [dirty.little.secret]. 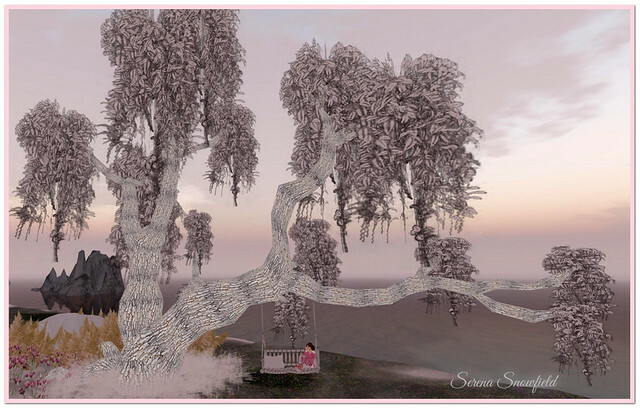 The gift includes this ginormous tree, fluffy white grass, and swing with animations (the tree is actually a bit whiter than it appears here at sunset). The [dirty.little.secret] group is 150L to join, but they are so generous with group gifts. This snuggly outfit is the Frozen Treats Hunt gift from Vips Corner (#5). Included are the leggings, UGGs boots, and fuzzy, pink sweater. There is also a men’s gift in the box (not pink, don’t worry). The Frozen Treats Hunt ends on January 15th, and all items are 1L each. My necklace and earrings are by Ben’s Beauty, and are available for 55L this week at fi*Fridays. It includes a menu selection of 7 different stones. My cute ponytail hair is by >TRUTH<, and is a TRUTH District group gift (only available at this location). The gift includes a fatpack of colors, color-changing headband, and your choice of colors for streaks… or no streaks at all, if you prefer. This gift has been out for quite a while, and I was so happy to see that it’s still available! Categories: accessories, events, hair, hunts, jewelry, mesh, other, pants, shoes | Tags: ben's beauty, diesel works, fab free, fabfree, fabulously free in SL, free, Glam Affair, group gift, hunt, Ikon, Izzie's, Redgrave, Second Life, Serena Snowfield, sl, TRUTH, vips corner, [dirty.little.secret] | Permalink.